Vacation with views in one of Tucson's best areas for easy access to shopping and recreational attractions! An outstanding vacation home in a quiet neighborhood with covered patio and beautiful pool and spa complete with barbecue, outdoor furniture and lounges. Take advantage of the Arizona sun or relax and read in the shade of a large shade umbrella. 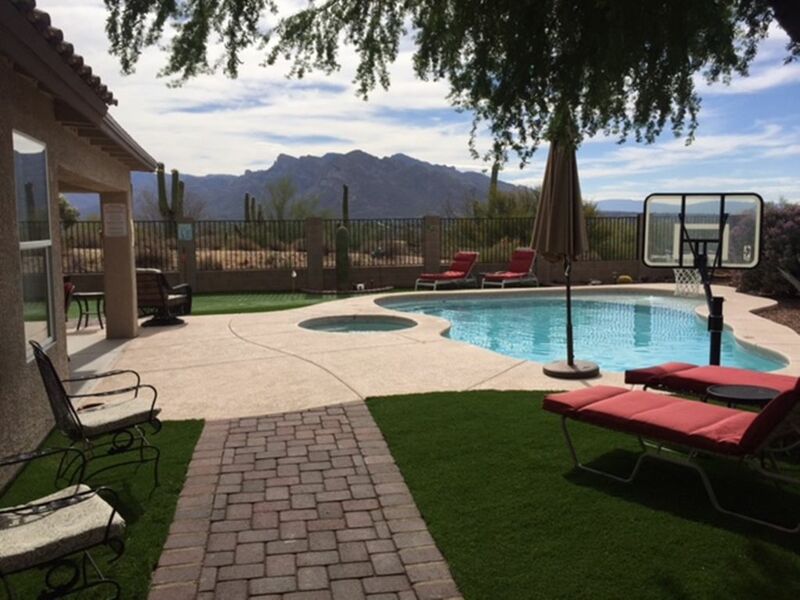 Picture yourself sitting on the patio, lounging by the pool or soaking in the hot tub, all with panoramic views of the Catalina Mountains in Tucson, Arizona. Enjoy the changing colors of the Eastern horizon as the mountain shadows change the view into a tapestry of color. The Eastern orientation of the living area provides the best of early morning warmth and protection from the late afternoon sun. This home backs to the desert which provides the ultimate in private outdoor living. Things To Do: Tucson is a Mecca for the outdoor enthusiast with plenty of golf, biking, and hiking to provide hours of entertainment. Not an outdoor enthusiast? Not to worry, there is plenty of shopping and sights to see in Tucson and the surrounding area. We would be happy to provide you information that will make your stay here the best vacation possible. Scenic Drive: You can leave your desert oasis and take a short thirty minute scenic drive and be in the pine trees of 9,000 foot Mount Lemon. I moved to Tucson six year ago and retired four years ago. We became involved in the vacation renal business first by acting as a golf guide for vacation guests that stayed at a vacation rental across the street from our home. Picture is of my wife (left) myself and a friend (right, red hat) taken at the rental home. We purchase this property for vacation rental because if is in our neighborhood, has great views, came furnished and was in excellent condition. Panoramic View of the Catalina Mountains from pool and patio. Local service and incoming long distance. Fully equipped. You only need to brind the food. Room for three at kitchen bar. with Basket Ball hoop Can be heated at an additional cost of $300 per week. There is parking for one car in the garage and two cars can be parked in the drive way. The Homeowners association CC&R's prohibit parking in the street over night. Vehicles parked on the street over night are subject to being towed at the owner's expense. This is an exceptionally nice home with beautiful furnishings and a sunny backyard with great views. We absolutely loved it! We particularly enjoyed the spa, since the weather was cold the week we were there. Rich was great at communicating with us before and during our stay, and was very helpful in resolving a couple minor issues. We couldn’t have had a better experience. Good location and the house was everything we wanted. We had a wonderful stay at this property. The hot tub was very nice to use. The house was well stocked with everything that we needed. This was our first stay at Catalina Mt Views. We would stay again. Richard runs a very comfortable property which is well appointed. The yard is really fun with a putting green and a great pool. The beds are comfortable. Very well-equipped, great views, attentive manager. Staying here is like having the best of both worlds—a high-end hotel but with all the comforts and convenience of home. This house has everything! Any little thing you can think of to make your stay easy, it’s there—from tons of towels (including beach towels for the pool) to coffee, condiments and spices. The location is perfect, close to shops and restaurants and less than an hour from pretty much any attraction. Yet the backyard looks as if it’s on your own private piece of the desert, with an amazing view of the mountains. Rich is very helpful and communicative. We paid for the pool to be heated (totally worth it in December) and he refunded us our first day because the pool hadn’t heated to temp yet. I can’t imagine a more amazing place to stay in Tucson and it will be our first choice should we return. Totally worth it. We had the best time in Tucson - 100% because of this house! My husband and I went to Tucson to figure out if we wanted to retire there, so we stayed at the house in The Bluffs instead of a hotel. OMG! Not only do we want to move to Tucson now... we want this house!! It is perfect in every single way. We went house hunting over 4 days and literally looked at over 50 houses. None of them compared to this house. My husband said we really set the bar too high. While it's close to everything, it still seems like you are in a nice secluded area with incredible views. The neighborhood is well maintained, clean and quiet. The kitchen appliances, cabinets and granite were beautiful, the master bath was amazing... the putting green, the pool, the hot tub. It is hard to point to one thing. I was excited I was able to meet Rich and talk with him for a bit (get some advice). He made our booking and stay easy -- we didn't need him for anything, but it was nice to know he was so readily available. We really really miss being at this house. It is a wonderful oasis for us and we can't wait to go back. Thank you!! Pool heat $300 per week Cleaning required every two weeks unless waived. Payment accepted in the quoted currency (US Dollar) Although the quote will show tax on all rentals, there is not tax on stays of 30 days or more.